← Do we really listen to children and young people in health care? What does it take to build a change platform? If you had asked me this question a year ago, I would probably have said that I had no idea. And yet a year later, it seems that that is what we have done. On Friday we were absolutely delighted when Helen Bevan and team included #MatExp as one of the top change platforms in a global webinar. I think a big part of my philosophy is not to try to ‘bottle’ something that is a bit magic – other than in this wonderful #MatExp bottle distilled by Jenny Clarke. 😉 People want to feel part of growing something themselves rather than just taking on a formula dreamt up by others, however successful it may be. It always felt like a let-down on Blue Peter when they said “Here’s one I made earlier” and all the fun of discovery was removed. Similarly, whilst it felt exciting to read a tweet the other day saying that our Whose Shoes? workshops should be ‘mandatory training’ for all, this goes directly against what I am desperate to achieve, which is to help people, users and healthcare professionals, devise and own their own solutions, working together as equals. It can never be a top-down approach. The #MatExp journey has been and continues to be extraordinary. Starting as a planned ‘very small pilot’, it has combined the energy of vibrant workshops with the speed and connectivity of intensive social media. I started using the #MatExp hashtag back in about September 2014 and registered it with Symplur as a way of monitoring its reach. I had previously done this with #dementiachallengers, so knew this would be be important. I am somewhat blown away by the fact that #MatExp now has over 144 million Twitter impressions. It has created a virtuous circle. People tweet photos of the workshops, make positive comments about the experience and take real action. As other people see this and pick up the energy, they too want to get involved; as more people get involved, the workshops get even better. In the jargon ( I am not a fan of jargon) we ‘pull’ people in rather than telling them what they should do. Some of the slides that Helen Bevan included really struck a chord with me. 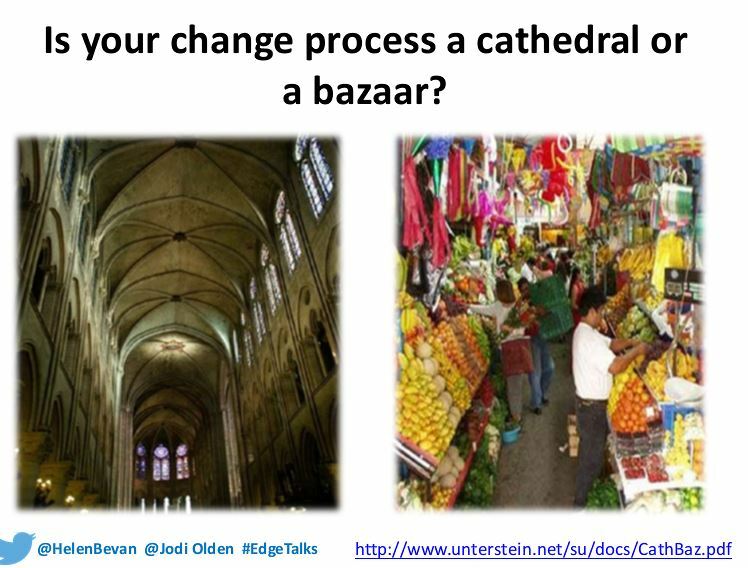 I absolutely love the idea of comparing building a change platform to running a bazaar. You cannot see anyone in charge but no doubt someone somewhere has thought to get it started in the first place … and then perhaps would be in a lot of trouble if they tried to stop it! A bazaar is such a colourful, vibrant and slightly chaotic image – it describes #MatExp perfectly. I tell the story of how my wonderful #MatExp ‘partner in crime’, Florence Wilcock first contacted me and describe the birth of #MatExp in a visual story here and in a blog here. 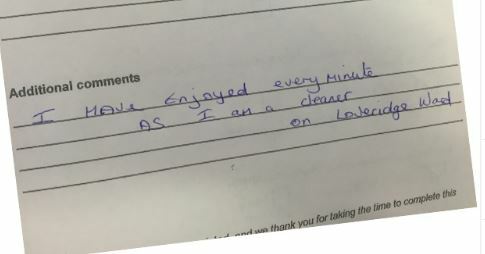 In partnership with fab can-do Kath Evans, NHS England, and the London Strategic Clinical Network, we initially ran five pilot workshops to bring ‘users’ and a wide range of health care professionals together as equals to test the new co-produced Whose Shoes? maternity scenarios and spark real conversations for positive change. We ran round with a video camera at the workshop at Queens Hospital – an impromptu attempt to capture the energy of an event in progress! We produced a toolkit to support the use of the board games – practical help with running future events. We ensure that everyone has a voice – all perspectives are equally valued. 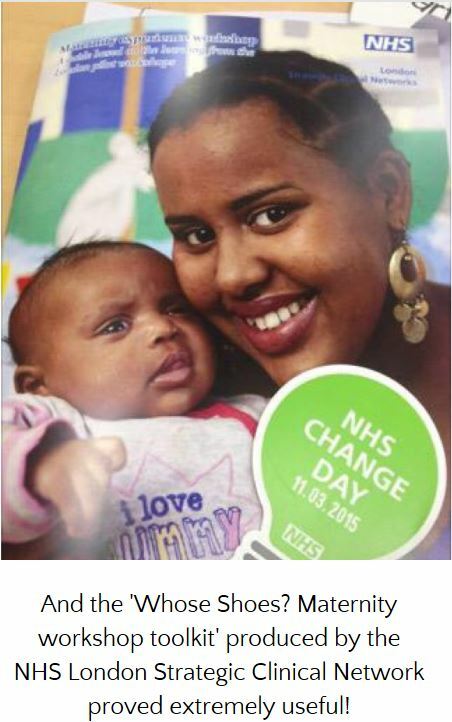 We were invited to be one of the supported NHS change day campaigns. They came to film us talking about #MatExp and what we are all trying to achieve. We gave the team a few headaches as we wanted to include so many actions. We had a team of people – about 50/50 health care professionals and ‘users’ leading the different actions. These ranged from Skin to Skin and optimal cord clamping at the time of birth, to good practice around communication, supporting mums and families post-natally (including depression) and many other topics. The most dramatic action was Florence’s ‘Lithotomy challenge’. This is currently causing a lot of interest – 700 ‘hits’ on my blog yesterday either reading Florence’s personal story or reading about the ‘lithotomy challenge’. Not bad for ‘old’ blogs! Helen Bevan and others from the Change Day team came to see what we were up to at Kingston Hospital on 11 march, NHS Change Day. They interviewed Florence while she was doing her lithotomy challenge. I ran a ‘drop-in’ Whose Shoes? session in the ante-natal clinic and appear on the film for five seconds at 7mins 30. Blink and you miss it – my Mum did! People have come forward as leaders – particularly Mums keen to share their stories in a practical and constructive way to help the NHS make changes to improve the experience of women. 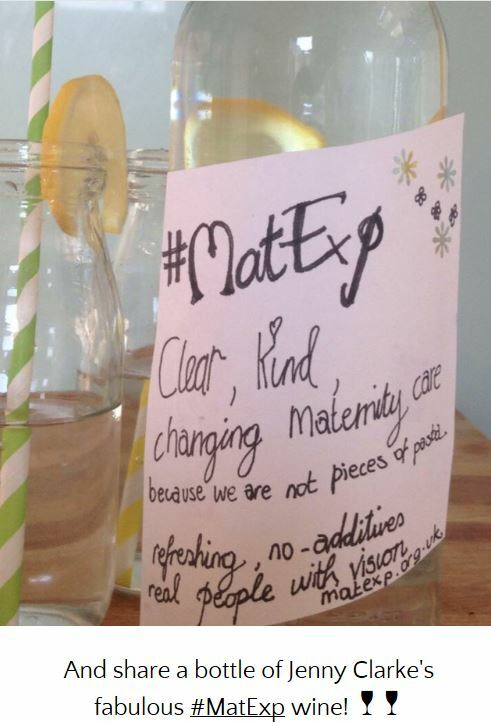 There are some wonderful bloggers – take a look at the #MatExp hashtag and you will quickly pick up the main ones. We are finding ways of feeding these directly to the new Maternity Review Board. The Mum-leaders have set up a website: matexp.org.uk. Again, you can find many of the best blogs here. They have set up a Facebook group – it is a ‘closed’ group but you can apply to join – just post a comment on the blog or contact one of our fab ‘Admin Mums’ on Twitter: @heartmummy @leighakendall @ESasaruNHS @Ghostwritermumm. We have just come to the end of #FlamingJune – an incredible month of action. We invited people to take real actions for positive change and have been totally overwhelmed by the response. Have a dip into this page to see some of the actions people have been taking. 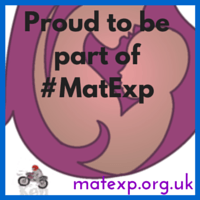 Visit the matexp.org.uk site to find out more – and most importantly to join in! #FlamingJune may have finished – but July, as you will have felt, is even hotter! The Royal College of Midwives (Better Births) project came to Kingston hospital to make a film about the project. Whose Shoes? is now being seen as a powerful and engaging approach to service improvement. It has been used by over 300 organisations (Local authorities, universities, care providers and more recently the NHS) in many settings over the last six years and now the maternity version is proving popular. Last week we had #MatExp #WhoseShoes sessions in Guernsey and at St Thomas’s Hospital in London. Click here for the visual story of the Guernsey workshop – including some photos of the beautiful island! Everything about #MatExp is action-focused. JFDI is the name of the game – which occasionally gets us in trouble but far more often gets things DONE! @WhoseShoes @SagefemmeSB @GEHNHSnews @helenbevan @LesleyPageRCM @JennytheM I get it now! Ha ha we should all JFDI! All of the workshops conclude with people making pledges. This has led to a bit of healthy competition between hospitals. They use their wonderful graphic records, produced by Anna Geyer, New Possibilities, as an action plan and are devising different ways to follow up. I am hoping the formal results of the London pilot workshops will be available to share soon. @CamellaMainMw @WhoseShoes @GSTTnhs @maryamidwife @GSTT_PDMs Such a good day and great to hear the pledges. And new people joined Twitter – and will help grow the movement! 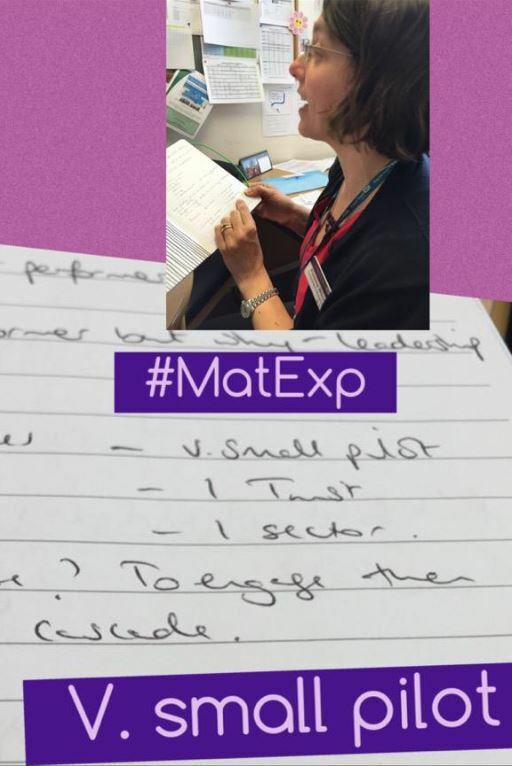 I am sure Sheena Byrom will be happy for me to add ‘our book’ to this #MatExp round-up – published in March and already going into a re-print. I am very honoured indeed to have contributed a chapter to this book, talking about the Whose Shoes? concept. We are attracting interest and support from high places, including the RCM and the RCOG and the Maternity Review Board. We have a lot of fun. Online friendships have become real friendships. Collaboration is strong. We encourage each other – and egg each other on. We are impatient for change. I am not sure how the whole #Matexp change platform can really be evaluated. I think the NHS London Strategic Clinical Network are evaluating the project that they originally commissioned. I think the NHS Change Day people are evaluating the impact of the change day campaigns but hopefully can include the whole project in some way. We will find out more shortly, I think. I find it impossible to separate out different elements – and I think this is the nature of a change platform. I am really hoping that someone can get their head around the whole totality and evaluate accordingly. Oh and I think I may have graduated from the School for Health Care Radicals last week, in which case I am very honoured. I didn’t get round to buying my gown and high heel shoes in time and unfortunately missed it when I was away at my first maternity conference. It was a JFDI conference pulled together from nowhere by Jane Pollock, @midwife_jane, a fantastic midwife. And again some of the Twitter friendships became real life friendships. 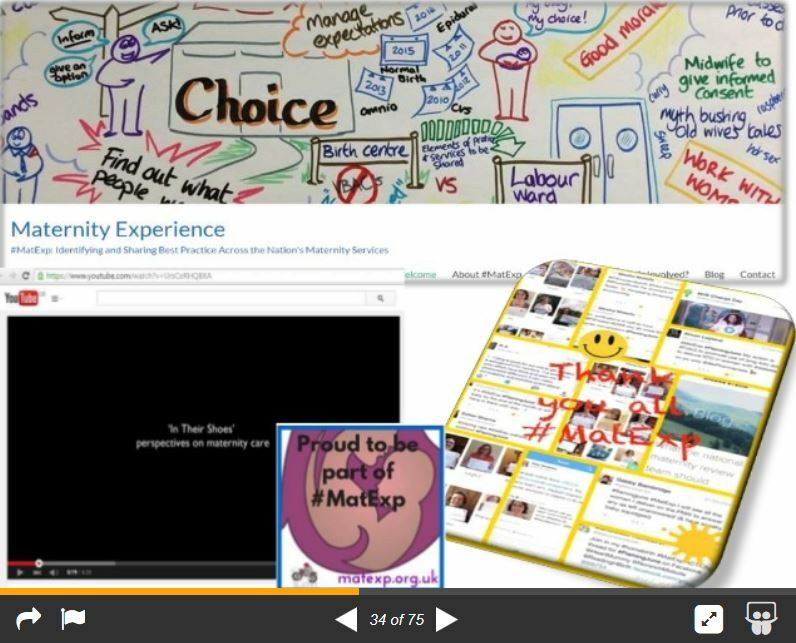 I hope you are inspired to join #MatExp – or to build your own change platform. Post a comment to encourage us – and there are plenty of people here ready to encourage you too! 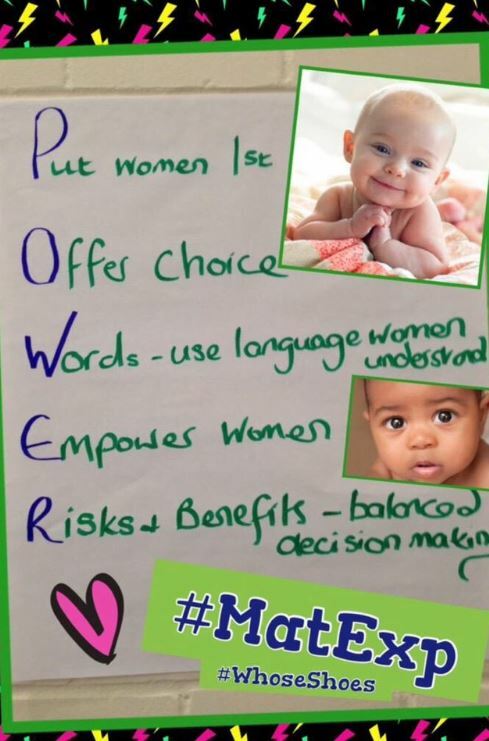 This entry was posted in Blogs, co-production, communication, community engagement, health, maternity, personalisation, well-being and tagged #MatExp, choice, choice and control, co-production, Compassion, empathy, evaluation, health, maternity, maternity review, respect, social media, Twitter, Whose Shoes?. Bookmark the permalink. Can’t believe I’m the first to comment! Probably aren’t. But what a blog?! The energy powers through from the screen. This is totally brilliant Gill – inspirational or what. Well done. And tell me, does JFDI mean what I think it does :)?